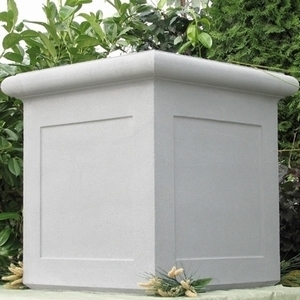 Sandstone Large Classic Square Planters & Pots | American Made Pottery from Arizona Pottery. Unique, Durable & Beautiful. Locating square and rectangle garden pottery is difficult to do. This is because it is hard to manufacture a square corner and while most manufacturers won't even try anymore, ours makes multiple styles to choose from. A decorative square that has an amazing oversized rolled rim opening and panel design makes these concrete planters stunningly beautiful. Large enough to hold flowers, shrubs, palms, cactus or even trees, these pieces of yard pottery work in all landscape designs. Our reconstituted stone containers are hand cast using a dry mix technique that incorporates concrete. Smooth, velvety finish and texture - these planters are truly a piece of art as well as a functioning piece of garden pottery. 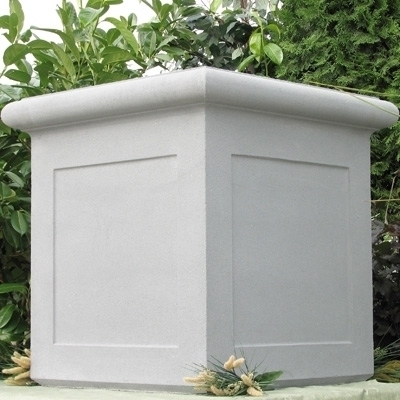 Used in Europe for centuries, dry cast stone has proven itself to be durable and high-quality pottery. Manufactured by Nichols Bros Stoneworks you know you are getting quality garden pottery, containers & planters using the finest materials & high-quality workmanship. NCB30P $863.00 30.00" 25.00" 30.00"
NCB36P $1,113.00 36.00" 30.00" 36.00"